Hoi An appealed to me simply because it is listed as a UNESCO World Heritage Site. 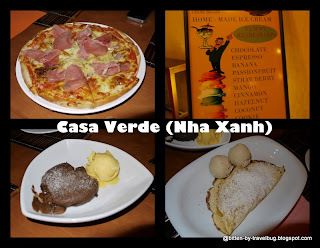 We did not make plans for Hoi An except for hotel reservations and scanned through trip advisor on where to eat. Our flight out of Hoi An was moved 10 hours later, to our advantage, we have more time to spare. A day and a half to spend in Hoi An was just right. Although the town is small, there are too many alleys and nooks to look into, restaurants to try out and activities to do. With less than a week, before our schedule trip to reserve, we were left with very few options in Hoi An. After shelling out more than usual for our accommodation in Hue, we opted to go on a budget this time in Hoi An at Sunflower Hotel. It's a two star hotel, which provides very basic facilities, a contrast to our superior accommodation in Hue. They provided free shuttle service from the hotel to the ancient town (5 minutes ride) and even to our choice of spa, anytime at your convenience. The hotel manager was also very nice and helpful. Whatever the hotel was lacking, the free shuttle service and the hotel manager made up for it. Roads in Old Town is closed to motorized vehicles, we normally cross the river bridge from Bach Dang Street or walk out of Old Town to Tran Hung Dao and take a cab from there back to the hotel. 1. Japanese Covered Bridge (Chua Cau or Lai Vien Kieu), on the west end of Tran Phu Street. 2. Tan Ky House, 101 Nguyen Thai Hoc Street. 3. Hoi An Handicraft Workshop, 9 Bach Dang Street. 4. Hoi An Museum of History and Culture, 7 Nguyen Hue Street. Cao Lau: This Vietnamese noodle dish is only available in Hoi An as it reputedly has to be made by water from a local well. Expect narrow, firm noodles with a tasty broth, lots of greens (veggies and herbs), and thinly-sliced pork. Although we didn't get to try this while we were in Hoi An, we did have a cup at Hanoi and it was really tasty. White Rose: The name for this popular appetizer comes from the shape when presented properly. White Rose is a plate of inverted dumplings; the noodle is folded neatly below the ingredients - usually shrimp and pork - in the shape of a rose. Hoi An Pancakes: Delicious and filling, this appetizer is a kit! Expect to receive a sheet of firm rice paper, salad greens, a bowl of water, and an egg omelet. With a little friendly instruction from the staff you will be folding tasty springroll-like pancakes to enjoy before a meal. Street food. There are several tasty looking street foods around Hoi An. The locals often sit on these red step stools and enjoy them on the side streets. We chanced upon this old lady frying quail eggs topped with some batter. It looked very appetizing and we sat and had some freshly cooked quail eggs, wrapped it with green leaves and herbs. Everything in Vietnam seems to be paired with green leaves and herbs, that should explain the slim figure of most locals. 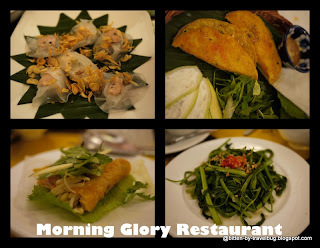 Morning Glory Restaurant, 106 Nguyen Thai Hoc Street. Serves a variety of local dishes. While there are cheaper places to eat in Hoi An, this one is by no means expensive, especially considering how good the food is. Most main courses are between 40,000 and 70,000 dong. Dinner and a drink cost about 80,000 dong per person. Casa Verde (Nha Xanh), 99 Bach Dang Street, ☎ 0510 3911594. Took us a while to find where this place is since the english names are not popular with the locals, only to find out that it's just by the riverside. This is a German owned restaurant known to serve some of the best pizzas in town. They also serve salad, homemade bread, ice cream and soft-centred hot chocolate cake are not to be missed. Wished I still have more room for dessert. 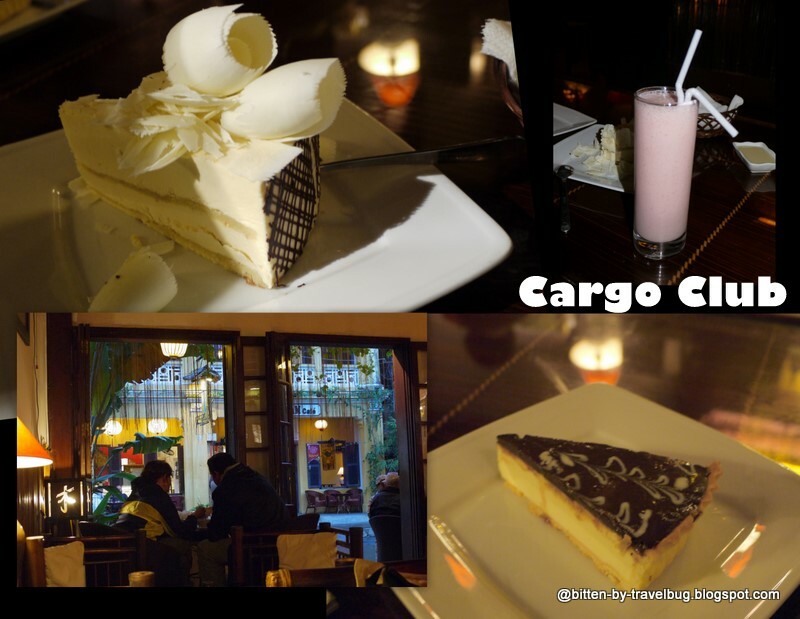 Cargo Club and Hoi An Patisserie, 107-109 Nguyen Thai Hoc Street. We ordered different slices of cake and drinks like the lassi and they were just excellent. I did not quite like visiting the museums. I'm more attracted to the facade and the ambience of the Old Town from the streets. Most buildings are run down but painted with bright paints of yellow, which made the city very attractive. The small alleys made it cozy to walk around. The cool weather was great, but the rain kept pouring. Red Bridge Restaurant and Cooking School is popular and get fully booked fast. 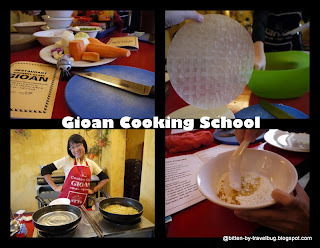 Gioan Riverside Restaurant Cooking Lessons, 94B, Bach Dang Street (Along the river in Old Town), ☎ 0510. 3863899. Since Red Bridge Cooking School was full, we opted and looked for Gioan along Bach Dang street by the riverside for private cooking lessons (as recommended by tripadvisor). The good thing about Gioan is that advance reservation is not required, it's a private class and will accommodate small groups, and do it at your preferred time. For $16/person, we had an hour of private cooking lessons with our choice of (four) menu. Chef Vina was particularly bubbly and speaks good english. We had a great time and ate good food. We had one of the best tasting Pho during the trip. Day Spa. 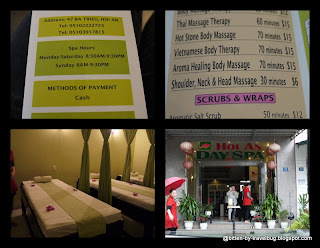 We went to Hoi An Day Spa (as recommended by tripadvisor). We opted for the Vietnamese massage for $12. It was pretty much like swedish, using oil however, capped by warm ginger "sauce", it felt and smelled like ginger sauce poured unto me, nevertheless soothing. Biking around ancient town. If biking is your thing (not mine). Lounge and stroll along the riverside. From Hoi An, we were headed for Hanoi. Our hotel arranged for airport transfers from Hoi An to Danang Airport for $15 on an innova. Danang Airport is the nearest airport to Hoi An but it's one hour away. We took budget airlines JetStar airlines and we were too early. We had to wait for quite some time at the airport before check-in counter opened. As soon as check-in counter opened, we were in for the shock of our lives, the locals apparently don't observe queues. We had to gang up with other tourists to keep us in line. These locals can be rowdy without them knowing. It's a race at the check-in counter even boarding the plane. I aired it to the stewardess but just got a nod - oh my, if you can't beat them, join them, live like the locals do! Next Stop: Hanoi and Halong Bay Cruise.